You can try giving MSA a call and see if they have any in. It's not a part that anyone produces that I know of, so it's kinda hit or miss. Ebay's a good place to check too for NOS parts. The all seem to say they go up and down with the power on/off switch however, but do say they will provide with the correct connectors which would save some soldering or other jury rigging. Our Power Antenna comes with a 31 inch Stainless Steel Silver (chrome) Mast--just like OEM, our competitors come with longer 39 inch masts which look terrible because they are too long!!! Front or Rear mount design, 5 section stainless steel Mast, High Quality construction, AM/FM excellent reception, fully automatic (goes up and down with the car radio ON/OFF), quiet operation, waterproof housing, 0 to 30 degree mounting angles, High Torque motor designed for long life superior pushing power. I'm in need of 2 power antennas and my son and I have not had any luck with the 2 old originals. I am interested in this new one that Go240zags found on Ebay. Has anyone purchased one of these before? If so, how did the installation go and how well does it work? Has anyone ever tried using the stock 280ZX antenna? I did a search and found no discussions on its compatability or ease/difficulty of installation. I've been looking at a few of these too. I think there are few of them out there that go up/down with the switches that we have on the older stock radios. Note the ad on eBay indicates " fully automatic (goes up and down with the car radio ON/OFF)". It's not a big point unless you are trying to keep things fairly original. On the other hand, if your radios are recent aftermarket equipment, that may be exactly what you are looking for. 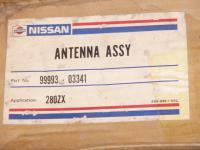 It's not at all unusual to see used antenas out of a 240Z on eBay. I'm speaking without experience here but I see no treason why you couldn't wire any of these antennas to work off the stock radio, after all, it's bound to have a +12 volt trigger wire too. In the case of the old one it's manually activated rather than automagically like with newer radios. But I'm just speculating here. 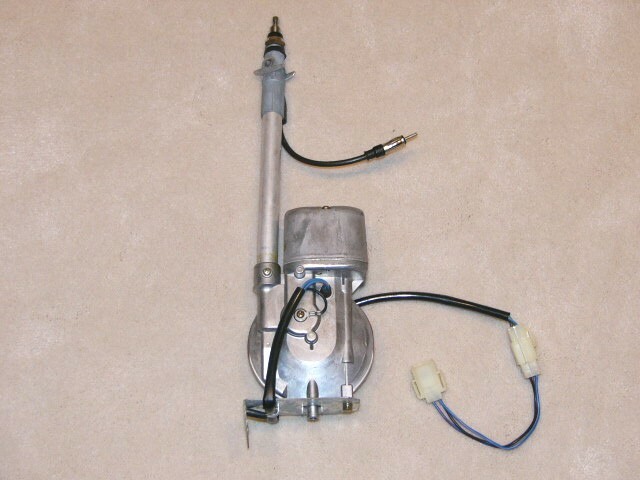 The problem with wiring a new "Fully Automatic" antenna with the old Manual wiring, is that the Full requires a source of constant power and a secondary connection to the radio to sense when it's turned on. They are simple plug and play with new stereos although you do need to run wiring for them all the way to the back, not only extending the "Blue" wire but also their +12v power lead. They will operate in their Fully Automatic Mode, i.e. Radio goes ON, Antenna goes FULL UP. Radio OFF, Antenna goes FULL DOWN. There is no stopping part-way up or down in the Fully Automatic Mode. To make a Fully Automatic Antenna function AS IF it were the older MANUAL antenna, you need to "fool" the wiring. These antennas operate via a DPDT Relay mounted on the antenna proper. When the Blue (typically) wire receives +12v, it closes the relay and provides power to the motor to raise the antenna. When the power is then shut off (the Blue is powered down) the relay then opens and still allows power to the antenna, but only to retract it. The motor in these antennas simply inverted the wiring, and hence the motor's polarity to go up/down. But there is where the problem lies. 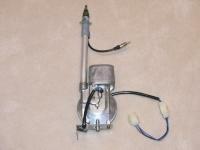 The old style manual antenna's motor has two different + wires. One to raise it, and another to lower it, while maintaining a comon - ground. The switch at the radio is a simple momentary SPDT switch. That is, a Single Pole, Double Throw. The switch either sends +12v along the Blue/Red or the Blue/White and the motor operates accordingly. 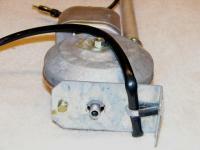 It does not switch the ground as a Fully Automatic antenna does to it's motor. To make the Fully Automatic antenna work with the ORIGINAL wiring (i.e. one pair of wires going to the antenna), the problem lies in making it operate as the original antenna did. Since the motor now has a relay, you must connect it in the following manner. Take the RED +12v wire the antenna requires for constant power and connect it to the Blue/Red wire at the original antenna connector. Take the BLUE "Power Sensing" wire and connect it to the Blue/White wire. At the Antenna Switch mounted on the Radio Face Plate. 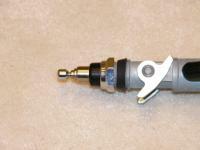 You need to replace the switch with a momentary DPDT Center OFF switch. This switch will have a toggle or a slide (as the original does) and will normally rest in the middle. When you toggle in either direction it will connect and because it is Momentary Contact will snap back to the center (off) position when released. This is the "fooling" mechanism for the relay at the antenna. To "fool" the Fully Automatic Antenna into allowing us to raise the antenna only PART way up, then we must both provide +12v through it's Red wire AND it's Blue wire and be able to kill power at the point we want the antenna to stay. Conversely, when we want the antenna to go down, we want it to receive power only as long as we let it....but ONLY through the Red wire. The ORIGINAL switch at the radio receives it's +12v via the BLUE wire and then either sends it out via the Blue/Red or Blue/White. Take the BLUE wire and connect it to BOTH "B" terminals of the NEW DPDT switch. Take the Blue/Red wire and connect it BOTH of the terminals along the same side, that is, A1 and B1 or A2 and B2. Take the Blue/White wire and connect it to EITHER the other A or the other B terminal. Which one you pick will determine in which direction the switch will raise the antenna, so take that into consideration. Usually, in Toggle switches, if you toggle down it's the Upper contacts that are connected and vice versa. That's it. To raise the antenna, toggle the DPDT switch and it will provide power along BOTH the Blue/White AND the Blue/Red wire, which is what a Fully Automatic antenna wants to RAISE the antenna. When you release the DPDT switch, it clicks back to it's CENTER OFF position, cutting power to both wires and thereby stops the antenna at whatever position you released the switch at. If you toggle the switch in the opposite direction, you only provide power along the Blue/Red wire and hence only that power that the antenna would receive when it's power sensing Blue Wire has been disconnected....as if you'd shut down the radio. Again, when you release the toggle, it cuts power to the antenna, and it stops. Nice write-up Enrique. One question though. Why would anyone NOT want to raise the antenna all the way up? Is this mainly to preserve the "stock" functionality, or is there some other not so obvious reason to do this? I am assuming that not having to worry about maintaining the stock behavior would greatly simplify things. Probably the biggest reason people might chose to not put the antenna all the way up, is simply to protect the antenna from being hit or broken off. There are also some FM and AM stations that come in better when you don't have the antenna up all the way. I've found that one station that I listen to near my house comes in great with about 12" of antenna, then as I travel from one side of town to the other, I have to extend the antenna fully, then again retract it to about 20" as I go through "the tunnel" and the Zoo's Hill. Others may have other reasons, but I believe these are the main ones. As low as these cars sit, I'd hate to have a full mast of antenna while sitting in downtown traffic with all the bicyclists or pedestrians trying to walk around the car. I bet it would snag one or two before being snapped off. 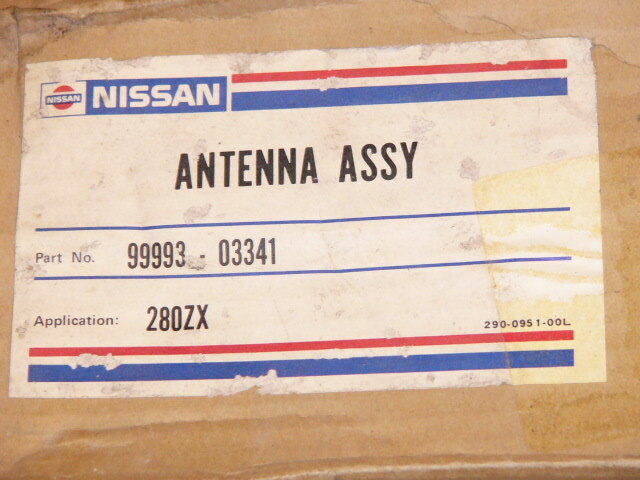 i purchased a "factory" complete antenna from nissan a few years ago..
Do you mind if I ask what you paid for the NOS factory antenna from Nissan? Do you know if they are still available? I’m nearing completion of my audio system consisting of Head unit, Amp, speakers w/ crossovers I my 77 280Z. I have done a “sound test” just to hear system before putting everything back into console (what fun😏). Cd source sounds great but now I must hook up the radio antenna. I am using (used with former setup) a power telescoping antenna working off manual toggle switch that allowed antenna to stop in position as well as up/down. However, since the whole system was apart/disassembled for over a year, I can’t remember how the old system connected to factory wiring (same antenna) to repeat with new system... 77. factory wiring diagram shows solid blue, blue/white stripe and black ground to power antenna. (No blue/red stripe anywhere in loop...240 Z different?). What is most confusing to me is antenna has power wires 2-reds, 2-Greens and the black ground (that was grounded to metal under hatch deck). What are/why the double sets of red&green wires and which combination would go to solid blue (power from the the ignition switch?) and which to the blue/white stripe (unknown function and/or power source)? The back of the toggle switch has the same 2-red, 2-green, black ground wires. How to connect each end of this antenna-toggle switch circuit to blue & blue/white factory wires🤔. Anyone used this antenna type wiring? Please help me solve mystery...install sheet long gone and can’t remember mfr. thank y’all!